Last week, we watched, Fed Up, a 2014 documentary focusing on obesity, particularly in children. After viewing the movie, my husband asked, “Any surprises?” There were two. Here’s the first. I didn’t expect to see a cameo of my West Point classmate, Congressman John Shimkus R-IL. His face flashed by during a segment decrying the nanny state in the US. Without dialogue, whatever point he was making was lost. But his image followed that of Sarah Palin who was rallying support for Big Gulp drinks. How do we connect the dots? Was his agitated expression about the regulatory reach of the government? I’m not sure but it got me thinking about how intertwined the government is in our lives. We are pleased when it works to our advantage, but incensed when the laws seem petty. Who determines where to draw the line between helpful and over-bearing? Here’s an exercise that would give a perspective on the government’s reach. Spend a day noting everything you encounter that is government regulated. If you stick post-it’s on relevant items, you’ll find there’s a lot of little papers representing oversight and enforcement. As a start, here are some of the regulated items: building codes, seatbelts, helmets, drugs, alcohol, roads, public education, law enforcement, ADA, immunizations, airports, roads, driving, food… And since tomorrow is April 15th, how about taxes? 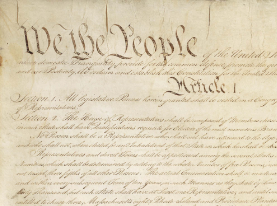 The preamble to the Constitution provides a mission statement for government: establish Justice, insure domestic Tranquility, provide for the common defence, promote the general Welfare, and secure the Blessings of Liberty to ourselves and our Posterity, which leaves much open to interpretation. Under the guidelines of that broad statement, government has grown into an expansive bureaucracy. How does Congress decide what qualifies for oversight? Sometimes we do need protection from ourselves. But then there are other areas that make you wonder. For example, Florida does not require motorcycle riders to wear helmets. But if you get injured while riding, there is the expectation that 911 will respond and a trauma center will treat you. Freedom needs to be balanced with responsibility. The primary purpose of government is protection; a concept that has expanded from defense against enemies, foreign and domestic, to safety, security, and an economic safety net. Our government tries to alert us to dangerous foods, which fits under the category of general welfare. Fed Up focuses on food, specifically sugar, and its regulation. The film raises an alarm about sugar and hidden sugars in processed foods and posits that sugar is a root cause of increasing weight. Here’s the second thing that I learned while watching Fed Up. 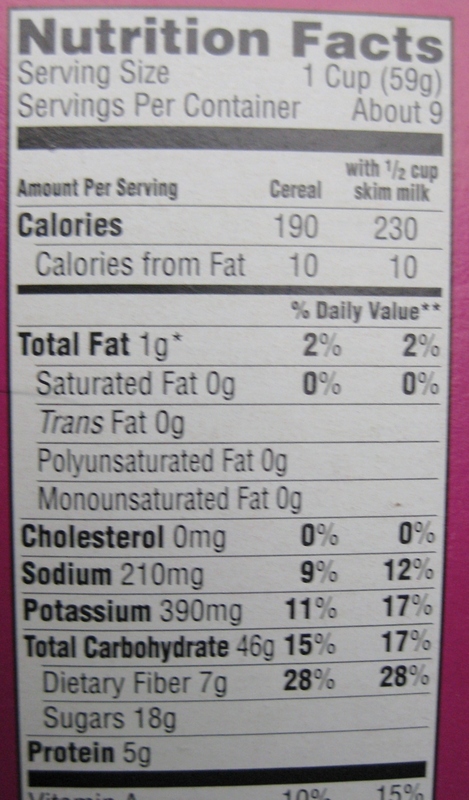 Nutrients are based on 100% of the daily requirements except for trans fat, sugars and, protein, which do not list a Percent Daily Value (%DV) on the nutrition facts label. Very interesting that those items have been exempted and no guidelines published. But the FDA is revising the labeling requirement so we’ll see how that turns out. Our diet, weight and health ultimately have economic ramifications, due to the consequences of obesity, associated chronic disease and health care. We are getting bigger. You can look at all the charts you want to see the upward trend with overweight. But take a photo of yourself and alter it by grabbing a corner and pulling, so you can view yourself as if you had an extra 20–50 pounds (next time you’re at the hardware store, pick up a 50 lb. bag of sand and see what that feels like). It’s more interesting to see the enhanced, fluffier version of yourself, than looking at numbers on a scale or analyzing a chart. While we may disagree on the extent to which government should insert itself into our choices and freedoms, we need to remember it is government of the people, by the people and for the people. If something needs to change, it starts with US.